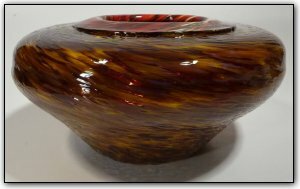 The exterior of this unique bowl features shades of gold topaz as well as specks of green and purple. It is also textured, which makes it very unique and adds depth to its appearance. The interior features many shades of reds, and the collar is a lovely combination of the interior and exterior colors.